As you may have noticed, I barely mentioned E! 's activities lately, and if they usually said something like: E! painted. That doesn't give credit to her work, because she is slaving over this "painting" thing. Below are two pictures showing her domain. It looks like an ER (emergency room) for windows and doors. 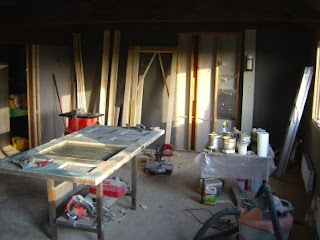 In the back you see the two doors to the bathrooms, stripped, sanded, primed, and painted. 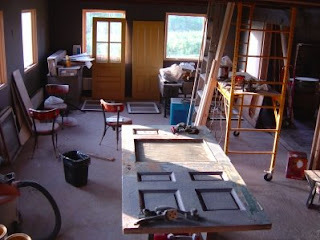 At their feet are window sashes stripped, sanded, and primed. The patient in the front is the door to the biergarten. Up against the wall in the picture below is the door jamb for the ADA bathroom door, as well as window and door trim, waiting to be painted. I can assure you, this is not fun work, in fact its very hard and dusty work. Getting the old paint off the doors and windows is quite difficult, and requires a lot of scraping and sanding. So tell my honey what a fabulous job she does next time you talk to her. In case you wonder why there are two comments marked as deleted, here goes: I very much appreciate comments, in fact I lust for them, which is why I allow anybody to leave comments. I do, however, like to keep this blog clean, i.e. rated PG-13, and also don't allow spam comments, which basically pitch someone else's website, blog, or product, especially by people whom I don't know.